Boasting sensational views, lifestyle options and a prime city fringe location, this stylishly appointed one bedroom apartment is situated within the quality One9 residential apartment complex. Highly appealing for astute investors and savvy market entrants, the property is currently leased under the “National Rental Affordability Scheme” until 25/02/2018 and returns rental income of $1157 pcm. 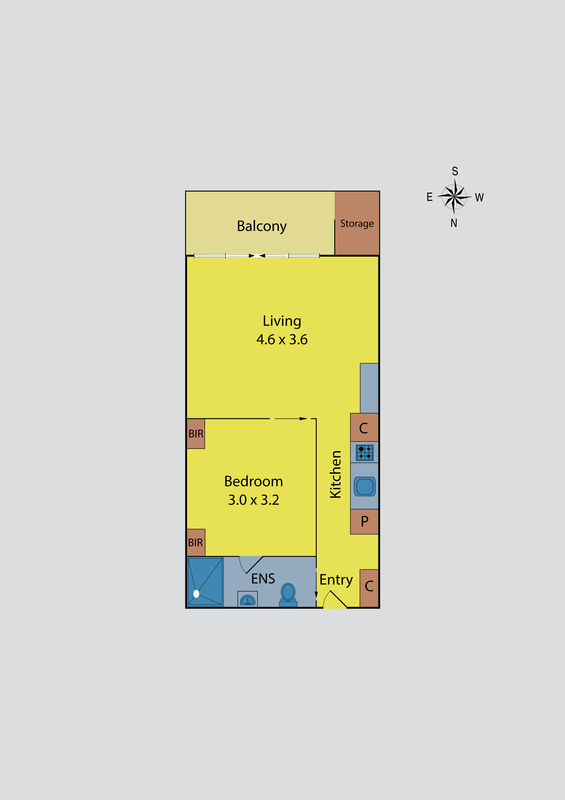 Embracing clever design an open plan layout comprises fully equipped kitchen and bright living/meals, with in-built desk, enjoying a westerly orientation, sweeping vistas and easy access onto a covered balcony featuring moveable louvered screens. A galley kitchen has all you need including stainless steel Smeg appliances, stone counters, pull-out pantry and an integrated drawer dishwasher. Smartly finished with custom built wardrobes/storage and privacy screens, the bedroom links to a fully tiled two way bathroom. Highlights include split-system, video intercom/lift, bike storage, double glazing, concealed laundry, modern floorboards and stunning roof-top common area. On its doorstep are vibrant Puckle Street cafes, boutiques, restaurants, Queens Park and all forms of public transport.